Your evening gown is lovely. I think you'll adore wearing it, and feeling the delightful swish of the long skirt caressing your ankles. I like that it's quite a different length than the skirts and dresses in most of your photos. My favorite length ends just below the bottom of my kneecaps, but I enjoy occasionally wearing skirts and dresses that end mid-shin or even ankle length. I am very happy you had such a wonderful time at the tea room. How charming to be in such a haven of femininity! I have to say that, "I love your dress...and have to know where you bought it..."
Lovely gown, quite the bargain. Now, about those shoes? A beautiful gown with a price to match! 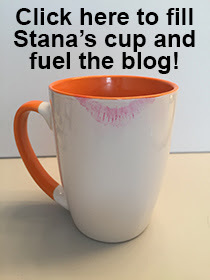 Enjoy, Stana! Becca --- I bought the dress at Macy's. I also saw it online at Dillard's.